Veneers are often prescribed by Dr. Lopez to correct chipped, stained teeth or gaps between teeth. They offer the perfect solution which are more customizable than bonding and do not require major customization like a crown fitting. Veneers are the solution that lies in the area between bonding and crowns. One important factor that should be kept in mind while considering veneers as an option is that they are irreversible. Once your veneers are applied, they stay for life. Even if they do fall off or chip off, they will be required to be replaced again. Veneers need to be replaced because they are applied by chipping off the tooth’s natural enamel. Once the enamel is gone, the tooth cannot be left exposed, and since enamel does not grow back, the application of the veneer becomes a must. Our Miami dental veneers, especially porcelain veneers, make for the perfect cosmetic addition to your tooth since they match your tooth’s color perfectly giving it a natural look. Also, porcelain veneers have the capability of reflecting light just like natural tooth enamel does, thus giving your teeth a natural look. They are wafer-thin shells that bond well with the front portion of your teeth giving it a fresh, clean new look with proper shape. Discolored and stained teeth due to heavy consumption of dark liquids like tea, coffee, or red wine. Discoloration could also happen due to root canal treatments, use of tetracycline or other related drugs, or use of excessive fluoride. Generally getting a dental veneer requires a minimum of two to three trips to Somi Dental Group. On your first trip, you will have a detailed consultation with Dr. Lopez and talk about your expectations of getting the veneer placed. He will then examine your teeth and ask you questions about your general health conditions to find out if veneers are the right treatment for you. Dr. Lopez will also discuss with you the various possibilities and limitations that come along with the placement of a veneer. He might then take an x-ray and impressions of your teeth and your mouth. He will also sketch a dental plan to schedule the procedures so that you are comfortable with the entire treatment. Dr. Lopez can install veneers on more than one tooth, simultaneously. During the procedure, our dental team will first prepare the affected tooth for the veneer placement. They do so by removing 0.5mm of enamel from the surface of the tooth which will be subsequently covered by the veneer shell of the same thickness. Before starting the procedure and removal of enamel, you might opt for anesthesia of the area around the tooth, in case you have sensitivity issues. Post-removal of the enamel Dr. Lopez will take an impression of your tooth and send it to a laboratory where they create a customized veneer which takes about 2-4 weeks. During this wait time, he will place a temporary veneer to cover the tooth, in order to prevent tooth-sensitivity issues. 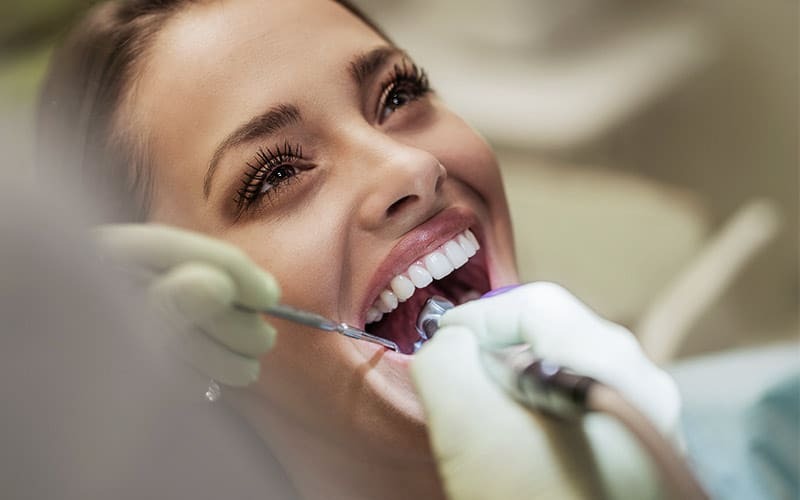 Once your dental professional at Somi Dental Group receives the permanent veneer from the laboratory, they place it temporarily on the affected tooth to check the fit and the color of the veneer. They keep trimming the veneer until they find the perfect fit to cover the enamel that had previously been removed. Dr. Lopez or Dr. Vasquez will also adjust the color of the veneer with the color of the cement to achieve the color that matches your natural tooth. Once the veneer is ready to be applied, your doctor will clean, polish, and abrade the tooth to make the surface less smooth and more agreeable to help the bonding process. He will then place the veneer on the tooth using the cement and fix it using a light beam for approximately 60 seconds. During this time, the light activates certain chemicals in this special cement which helps bond the veneer to the tooth. Your doctor will then clean up the excess cement and makes some final adjustments to ensure the veneer is fitting comfortably. Your doctor will then schedule a follow-up visit after a few weeks to check how the gums are responding to the new veneer installation. Generally, porcelain veneers work well with gums, and there are no side effects whatsoever. At Somi Dental Group Miami, dental veneers are one of our many specialties. They look like a natural tooth. Gum tissues work well with porcelain veneers. Porcelain veneers are resistant to stain and last longer. The color of porcelain veneers can be adjusted to assume the tooth’s natural color. Application of veneer does not require an extensive reshaping of a tooth that is required for crown fitment. Thus, it makes for an easier dental solution to cover up breakages and chipping. Application of dental veneers is an irreversible process. The cost of applying can range from anywhere between $800 – $2000 for each tooth, making it an expensive procedure. The procedure may or may not be covered by your dental insurance plan. Removal of the enamel during the procedure might make your tooth sensitive to cold and hot beverages and food if the temporary veneer is not used to cover it. Like crowns, veneers might dislodge if subjected to high pressures. To ensure that doesn’t happen, make sure you don’t bite your nails or chew on pencil heads or ice chips. Veneer covered teeth might still face decay, in which case it will be required to be covered by a crown, post-treatment of the decay. Like any other treatment, dental veneers come with their very own pros and cons. However, the benefits provided by it trump the drawbacks and promise you a beautiful smile. Veneers do not require any high maintenance solutions. By brushing and flossing regularly, you can ensure a life of a decade and above for your veneers. If you live in or around Miami, dental veneers could be a great option for you! Talk to our staff at Somi Dental Group today and find out if and how veneers can help you get a winning smile.